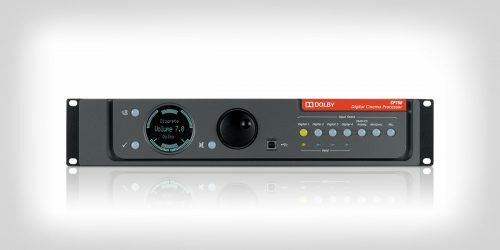 The new Rapid Rigging System from SLS Audio has been developed to drastically reduce the time and expense involved with installing and maintaining overhead surround speakers needed for Dolby Atmos® cinema applications. The system comes in 8 foot (2.45m) extrusion sections that can be connected together (maximum of 8 sections) into a single track. The track can then be raised up to the ceiling grid using standard rigging pulleys or motors. The track is then attached to structural steel mounting points with several cables ensuring stability and safety. Once the rigging is complete, speakers are attached to small Karts. These Karts are then loaded into the rail and attached to a drive cable. Using a small hand-held drill, the drive cable pulls the speaker Kart down the rail with the speaker wire trailing behind. Additional speakers are added and the rail and moved into position to complete the installation. Two tracks are required for a Dolby Atmos installation.